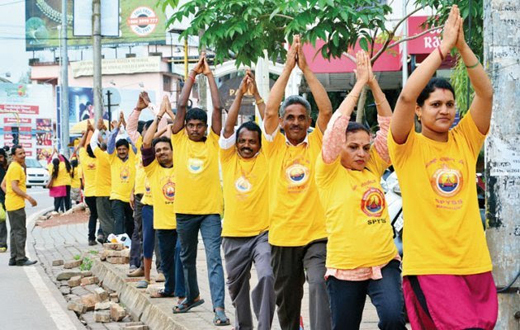 Mangaluru, June 23,2017: It is reported that a total of 1, 111 yoga enthusiasts did yoga on the footpath in Mangaluru city to create awareness among the public about yoga and its positive impact. The event was organized by Sri Pathanjali Yoga Shikshana Samithi as part of the international yoga day celebrations. The participants including women and children who performed yogasanas on the occasion. The performance held from Jyothi Circle to RTO Road early morning and yoga enthusiasts performed five asanas in the event. Only five minute long performance was organized to promote Yoga in the coastal city, said one of the organizers of the event. Now everyone has realized the importance and benefits of Yoga . Yoga is best way of keeping our body and mind fit . In present days as we have hectic schedule do not have time for ourselves,at least by performing the yogic postures we will be able to keep ourselves fit and healthy forever.